Most of us agree that it only takes a few dedicated individuals to make a difference. Too often, we don’t focus the spotlight on those individuals. One of the goals of e-Veritas, throughout our thirteen years, has been to ‘pay attention’ to those outstanding Ex Cadets and / or their spouses who are making a difference; 5586 Ian Mottershead and his wife Rosemary are salient examples of people who are making a BIG difference. Arguably the most sought-after ‘duty away’ dream of RMC cadets is to be chosen to participate in a Battle Field Tour (BFT). Just recently, BFT 2018 took place. It was the 15th tour for RMC over the past 16 years. For some reason for which we were never able to understand – the 2011 tour was cancelled. This cancellation was met with deep disappointment by the cadets, especially the IV Years, who were eagerly anticipating to experience what many of their seniors had raved about for the preceding three years. Ian Mottershead went on the 2013 Tour and it was everything he expected. So much so that he quickly became quite engaged. Over the last five years, he has been a donor supporting the annual Battlefield Tours, and last month, both Ian and Rosemary, went on the most recent one. The now 77 year old Ex Cadet who entered Royal Roads in 1958 noticed from the start that there were some younger staff making significant contributions. We have been around since these BFT started. Like most activities of this size and scope there have been a few complications along the way. For the first number of years it had been a publicly funded activity. Depending on the college leadership of the day it was not always a certainty that the BFT would be a priority in receiving public funds. With good reason the, Directing Staff, went through more than their fair share of frustration, far too often – wondering – whether the tour was approved…or was it not approved. It is clearly desirable that there be a greater degree of permanence of the tours in order to permit planning and preparation with confidence. Consequently, Ian and Rosemary are moving their support to a higher level. The tour was an incredible experience. The Mottershead’s support is incredible, and we’re very grateful for it. Great article! Ian and Rosemary, this is an OUTSTANDING contribution for you to do this. The value as you describe it above is bang on! Thank you for your leadership and your gift that will benefit Cadets and their roles as citizens and leaders across Canada. Well done. 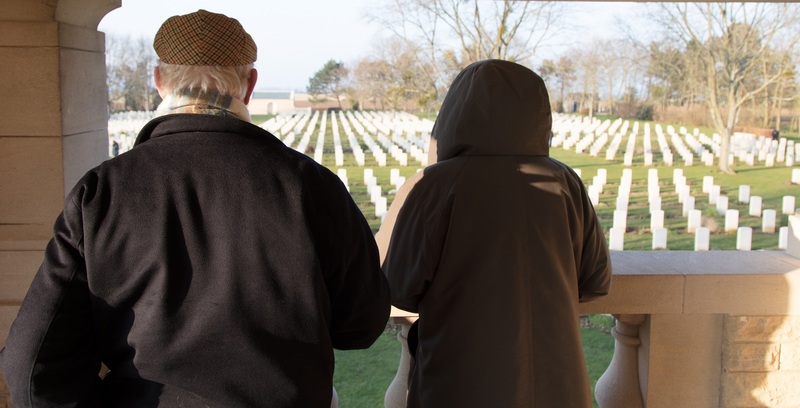 Thank you, OCdt (III) Colin de Grandpré for this feature on 5586 Ian and Rosemary Mottershead — I immediately recognized the Bény-sur-Mer Canadian War Cemetery from having visited in October 2017. It was my honour to pay tribute to the fallen there, and walk among them, before walking to Juno and standing in the water where our forebears fought, fell and won. I am glad cadets are getting the experience of walking in their footsteps on battlefield tours. “BZ” once again, mes chers amis! It’s bloody brilliant what you are doing for the good of the College – and for the future leaders of Canada – in whatever professions our cadets choose to serve as time goes on.